During the backend of last year, a lot preparation went into getting the Shield Golfs ready for battle in the Clubman’s and 111 series this year. With both MPC AND 111 series being timed based – a decision was made to use the green Golf to start the series. 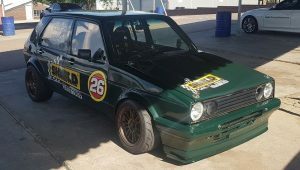 This Golf was successfully raced in the SA Endurance in 2017 and after removing roughly 30 kg of extra fuel tank and pumps, it was believed to be competitive enough to test the waters in the timed based series to get points on the board and an idea of the class to run in. Once the series settles down and a better understanding of the time slots and competition we have the option to bring out Golf 119 to use once we understand the dynamics of timed based racing. 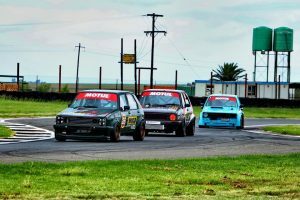 Round 1 of the Motul Clubman’s Championship got underway on February 15-16 at the fast and technical Red Star Raceway near Delmas. Three practice sessions on Friday allowed drivers the opportunity to get to grips with the cooler conditions, resulting from the adverse Gauteng weather experienced in the lead up to the weekend. Despite heavy rain clouds present over the circuit on Friday, the track remained dry. Race 1 saw all nineteen competitors take to grid for the customary rolling start around the anti-clockwise layout of the circuit. The Shield Golf 119 holds the lap record in this direction with blistering time of 2.17.35 . Due to a water clamp breaking in Qualifying, I was forced to come in on lap 1 and therefore started in the back of the grid in 19th position. Damp conditions at the start of the race, however, saw the more powerful turbocharged cars battling to put the power down onto the circuit which worked in the Shied 8V’s favour being a normally aspirated 2L engine. 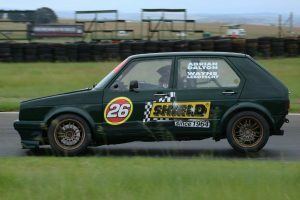 With a host of tight corners, inclusive of one of the longest straights in South African motorsport, Red Star Raceway provided me a slight advantage in the normally aspirated car and limited slip differential. When the chequered flag finally dropped, I was chasing down 7th spot to the wire and ended up 8th overall and 2nd in class. Weather was not kind to us in Heat two and a major cloud burst delayed proceedings for close to an hour with the extremely sad news of Photographer Nic Louw passing away at the track following an incident in which a Wesbank V8 slid off the track due to an extremely slippery surface, straight into and killing the photographer in the inner area of the track. Considering the above, I decided to pull out of Heat 2 not only to save the car but felt it was too risky as I could foresee several incidents happening under these appalling conditions. Several cars were damaged in Heat2 and believe it was the right decision to make at the time with a 111 and Clubman event around the corner. LOOK FORWARD TO SEEING YOU ALL AT ZWARTKOPS on 9TH March & MIDVAAL 23rd.